Earlier this year (2014), I happened to have a chance meeting with FZ FORZA in Asia. It is not a brand that is commonly seen around Asia but it has a strong presence in Europe. Looking back, it is a brand I have noticed become less prominent on the TV since its initial flourish in the 1990’s. Those times, you could see a fair number of Danish players using FZ FORZA. After chatting a bit to FZ FORZA, they explained they want to market more in certain Asian countries. However, they will not be going for the big sponsorship deals. Rather, they will be trying to focus on younger talents and up and coming countries. That sound like a strategy that benefits both young professional players trying to establish themselves and also exposure of the brand at a mid-­‐market segment. You may have noticed recently FZ FORZA Facebook in Singapore and Malaysia and a Weibo page as part of their soft push into social media sites. Some of you may have noticed the FZ FORZA website, the facility to personalize racquet bags and differences between the European and Asian catalogues. FZ FORZA tell me they put a lot of effort and resources into their products – the premise being able to have higher quality products at a competitive pricing strategy. Certainly, if they are not going to do the traditional marquee player/tournament sponsorship, then their outgoings risks will be smaller. Given that they promise a value for money product, they will be depending on customer loyalty and secondary referrals from this customer base. 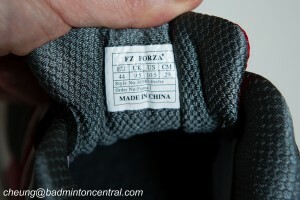 I will leave readers to investigate if their respective local FZ FORZA retailers are indeed priced more competitively. For this review, I will focus on the shoes. Interestingly, we do not get so many reviews of shoes despite our opinion that they are the most important piece of equipment to be chosen. Back in the 1980’s and before, it was common to see players either use squash shoes, or, if coming from China, canvas shoes with a thin piece of rubber for the sole. The late 1980’s and 1990’s saw badminton racquet manufacturers start to enter the shoe market. 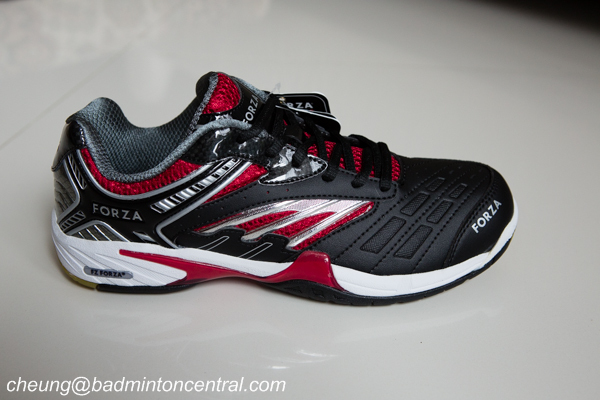 From 2000 onwards, badminton shoes have become increasingly more sophisticated. I was sent the Evolve shoes to evaluate. The Evolve shoes come in 3 designs with one of these targeted to lady players. There is a Lingus model above the Evolve that comes in striking neon green/yellow marking design. Personally, I prefer the black and red design of the Evolve – neon green/yellow doesn’t match my hair colour! I wore the shoes for a number of sessions and on different surfaces giving them a good workout. My previous experience with badminton shoes has been poor heel cushioning, thin forefoot padding, slippery soles, loosening of parts after only 2-3 months of use and poor stability. 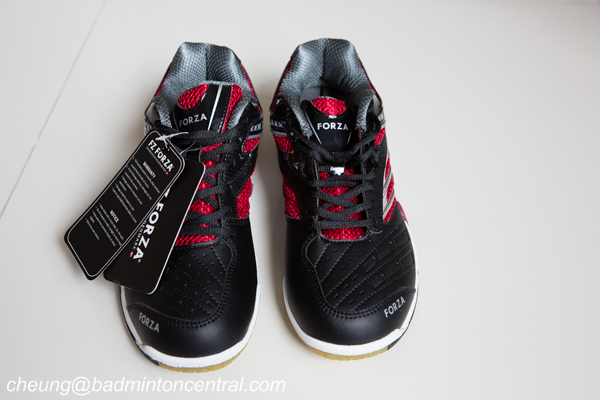 I have to admit there has been a lot of general improvement overall in badminton shoes over the past the last decade but these previous experiences have left me being a bit fussy about shoes. So that’s enough of the introduction. How did the shoes shape up under this review? Out of the box, the shoes come out with a label of instructions and a warranty of 3 months so long as the user has only used it: indoors, for the purpose it was made for, no repairs made by user and maintained properly. It is the first time I have seen a warranty on a pair of sports shoes. We see a mainly black coloured shoe with red and white trimming. The toes area arches up fairly high making it look like there is plenty of room for the toes. The synthetic leather is a microfibre polyurethane material. The lateral edge is mainly stiff white PU material with a piece of red plastic that comes up the side just past midway towards the forefoot. 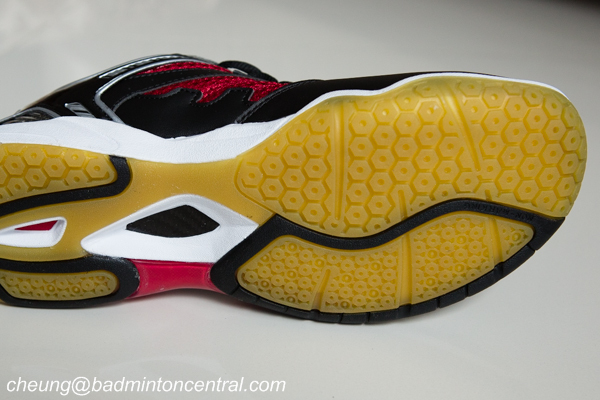 Going backwards, we can see the midsole area gets thicker for better cushioning. The mid foot to rear underneath area has more of the very stiff PU material for stabilising the shoe. The forefoot area of the sole has the multiple circular pattern for the twisting movements of the foot on the floor for badminton specific movements. Before putting the shoe on, I take out the insoles and replace them with my own custom insoles. I tie up the shoes and away on court I go. Usually, trying a new shoe out needs a bit of caution the first few times of use. The grip feels a bit different from the previous shoe I was using and a new sole takes a little time to wear in. My first impression of the shoe is that it is indeed a comfortable shoe. My feet are quite wide and I also wear ankle supports due to previous ankle sprains. The forefoot area has space so the toes don’t bang upwards into the shoe thereby reducing potential trauma to the toenails and is also wide enough so that the toes are not crushed together. The feet felt very stable in the shoe compared to the previous shoe I was using (won’t mention the brand). The raised red plastic on the lateral side of the shoe is no gimmick – it really contributes to the stability of my foot. Front back and jumping court movements – The forefoot area of the Evolve has enough padding that adequately cushions the impact with the floor with jumps. With the heel cushioning and my particular use, I use custom insoles that add heel protection. I didn’t experience any problems with heels on ground impact but it’s something I can’t evaluate adequately for this review. Just to mention the toes again, there is definitely enough room for my toes to be confortable. I tried the shoes out on a variety of surfaces and the shoes didn’t slide at all on even some very smooth surfaces. The shoe doesn’t feel unduly heavy on the feet. When I do the split step preload movement, I get a good pre-tension feeling in my leg and feet muscles to push off. Some other shoes I have tried have poor pre‐tension feeling that slows my movement and requires me to make more effort. Diagonal and turning movements ‐ My feet have a natural tendency to turn inwards and this creates problems when lunging forward for a shot. A leading foot that plants and turns inwards can roll the ankle and cause an ankle sprain. Good footwork training to turn the leading foot outwards on landing is the answer but there are occasions when it just doesn’t work like that in a game. I was very pleased to find the red plastic on the lateral edge is very helpful in this respect. It adds some extra stability so if the leading foot is unfortunate enough to have turned inwards, then there is less chance of rolling over on the ankle. 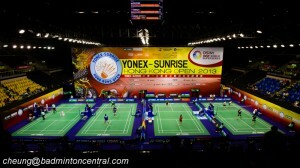 Multiple sessions have confirmed the shoe has good stability for singles and for doubles. For other shoes, I have found the shoe material on the side tends to stretch after some time. I don’t view it as a problem but I am pleased to note that the Evolve does not seem to suffer from this. Ankle supports are a piece of equipment I have used for many years – mainly to increase proprioception (or perhaps as a psychological prop) – and I had just bought a new pair of Mizuno ankle supports in Japan just prior to trying out the Evolve. Since the Evolve shoe felt so stable, I tried playing without my ankle supports. I was very pleased to find that my feet and shoes felt just as stable without the ankle supports with my foot still fitting in nicely into the shoe. The FZ FORZA Evolve shoe has impressed me greatly. It is a very stable shoe that doesn’t feel heavy on the feet and legs. Feedback from a couple of other local coaches on their first usage of the shoe has also been positive. Players who enter competitions/matches (even leisure players) are recommended explore this shoe further.